Bedford Blues went out of the British and Irish Cup on Friday evening as they went down 15-19 to Jersey. 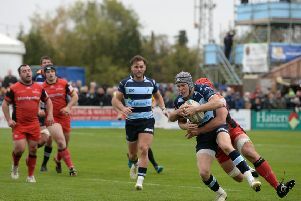 After seeing off the Blues, Jersey will travel to either Yorkshire Carnegie or Moseley for a last-four tie next weekend, seeking to secure a home final in on the weekend of April 9. The historic result for the Reds, who had never played in a knock-out cup match since reaching the national league stage, was built on the back of tough defence and immense power from the forwards. Two tries from rolling mauls, finished by James Freeman, helped the visitors to a 12-all half-time scoreline, with Dean Adamson and Piers O’Conor responding for the hosts. The Islanders have proven to be the thorn in the side for Mike Rayer’s men this season and they racked up their third win out of three meetings in the league and cup. Bedford were left massively frustrated at the final whistle as they did have opportunities to win the tie, but on one too many occasions the greasy ball slipped out of hand. Bedford took the lead with a penalty just after half-time, but a third mauled try by Freeman gave the visitors a lead they never surrendered. The Blues could, and perhaps should, have snatched the win late on when O’Conor took the ball well and galloped along the right wing, with Pat Tapley in support. A winning try seemed a certainty as O’Conor drew the defence and released the pass, but Tapley just couldn’t gather the ball and the Blues’ chance to win literally slipped away. Jersey breathed a huge sigh of relief and then saw the final minutes of the game out with pick and go rugby before punting the ball to touch and progressing to the semi-final of the competition. Next up for Bedford is a trip to Yorkshire Carnegie on Suunday, March 27.